Yankee Candle Pomegranate Cider Scent Votive Home Decor 4 Pack New Yankee Candle Pomegranate Cider Scent Set of 4 1.75 Oz Each Wrapped Votive First Quality Red Wax Burn Time 15 Hours Home Decor Cinnamon Cloves Vanilla Made in US Multiples Pomegranate Cider – Tart pomegranate juice with sweet vanilla and spicy notes of cinnamon and cloves. 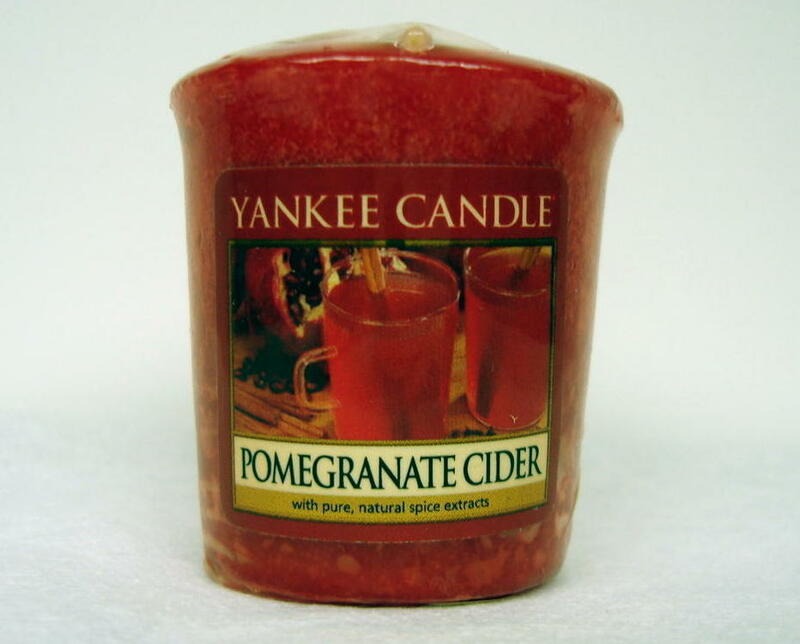 You will receive a set of FOUR Yankee Candle wrapped votives in Pomegranate Cider scent. They are FIRST quality and not seconds. Don’t let their little size fool you! Yankee Candle Wrapped Sampler Votives are long lasting and highly scented with exceptionally true to life fragrance. Yankee Candles are made using premium-grade, highly refined paraffin waxes specially blended for optimum burning and fragrancing. These versatile votive candles are perfect for fragrance layering, as well as sampling a new scent. Use several in multiple arrangements with different holders to dramatically enhance the atmosphere of any room. Experiment with two or more scents to create your own signature fragrance! Yankee Candle Wrapped Sampler Votives are first rate quality and individually wrapped and labeled to preserve the fragrance and make storage easy. Surprisingly long burning, each votive will last up to 15 hours in a proper candle holder and unlike cheaper votives, they will remain fragrant throughout burning, from beginning to end. Yankee Candles also make the perfect gift for any occasion. Shipping is based on US destinations via USPS Priority or First Class with delivery confirmation. International buyers please contact me for a shipping quote. I combine shipping on all items to the same address. A great way to minimize shipping cost per item is to purchase multiple items (fill a flat rate box for best value!). Items will NOT be shipped until payment is received and/or cleared. I have many other items available for your shopping pleasure. Please take your time and browse through the rest of my Marketplace. Click "MommyOf2QTs Marketplace" at the top of this page to see all the items I have available. Item categories are listed on the left for your shopping convenience. Accepted Forms of Payment: PAYPAL USPS (POSTAL) MONEY ORDER GOOGLE CHECKOUT CHECKOUT BY AMAZON CLEVERLY CONCEALED CASH (Mail at YOUR Risk) - select Money Order payment option Receive 5% discount on ITEM PRICE when paying by USPS Money Order or Concealed Cash. Discount does not apply to gift cards or shipping cost. To make return shopping easy, bookmark my Marketplace address into your browser's favorites list. I am always adding new items so stop in often. You never know what you may find at MommyOf2QTs Marketplace. Thanks for stopping by. Please tell your family and friends about my Marketplace here at the Bonanza Shopping Mall! ??????? ?